Hello Everyone! How was your Obon Vacation? Did you travel anywhere? 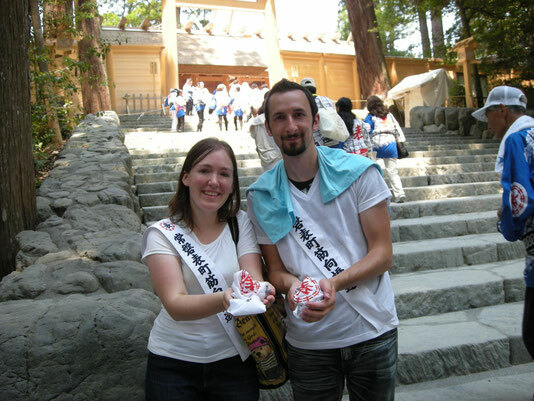 This month I got to see the new Ise Shrine during Obon! 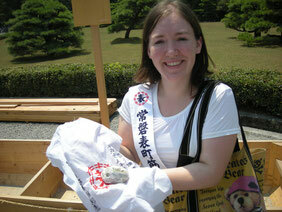 My club at school asked for volunteers to help transport rocks to the shrine (Shiraishi Mochi), so my club friends and I all signed up. It was a very hot day and we had to take many breaks to drink water and cool off. I was very tired when we got to the shrine, but my excitement overpowered my tiredness when we walked up the steps to enter the inner shrine area. I'd been to Ise Shrine 5 years ago, but I had thought that I'd never be able to see the inner area up-close. This rebuilding only happens once every 20 years, so my friends and I felt very lucky to be in Japan right now. My boyfriend and I put our white rocks side-to-side and then stood there for a couple seconds to soak in the tranquil atmosphere and to admire the beautiful shrine building. That area felt very special, and I felt honored to be there.